Big US cities could be squeezed by unfunded public pensions as they and counties face a $574 billion funding gap, a study to be released on Tuesday shows. The gap at the municipal level would be in addition to $3,000 billion in unfunded liabilities already estimated for state-run pensions, according to research from the Kellogg School of Management at Northwestern University and the University of Rochester. “What is yet to be seen is how this burden will be distributed between state and local governments and whether the federal government will be called upon for bail-outs,” said Joshua Rauh of the Kellogg School. The financial demands of unfunded pension promises come as state and local governments grapple with years of falling tax revenue related to the recession. The combination has raised concern that defaults, which are historically rare in the $2,800 billion municipal bond market where local governments obtain money, could now rise. “The bondholders would be competing with the pension beneficiaries for scarce government resources,” Mr Rauh said. Current pension assets for plans sponsored by Philadelphia can only pay for promised benefits through 2015, while Boston and Chicago would deplete their existing funds by 2019. Cincinnati, Jacksonville, Florida and St Paul have current pension assets that can only pay for promised benefits through 2020. Local governments use unique accounting methods that many, such as Mr Rauh, believe understate obligations. Based on his estimates, which use US Treasuries as the benchmark, each household already owes an average of $14,165 to current and former municipal public employees in the 50 cities and counties studied. “Philadelphia has the most immediate cause for concern, as the city can pay existing promises with existing assets only through 2015,” Mr Rauh said, assuming an 8 percent annualized return, the most common benchmark for municipal plans. In New York City, San Francisco and Boston the total is more than $30,000 a household and, in Chicago, it tops $40,000. Taxpayers in these areas risk not only local tax increases and service cuts to pay for benefits, but potentially some of the bill for the $3,000 billion unfunded obligations at the state level, the researchers say. “The fact that there is such a large burden of public employee pensions concentrated in urban metropolitan areas threatens the long-run economic viability of these cities, as residents can potentially move elsewhere to escape the situation,” Mr Rauh said. The research examines 77 pension plans sponsored by 50 major cities and counties and covering about 2 million workers, which is estimated to be two-thirds of workers covered by local pensions. Researchers then extrapolated the results – an unfunded liability of about $5,300 per worker – to come up with the total estimate of $574 billion. State Budget Solutions' (SBS) second annual state deficit report reveals aggregate state debt presently exceeds $4 trillion. In predicting states' future economic performance, New York, Vermont, Maine, California, and Hawaii scored the lowest in the rankings. The states on the other end of the list include Utah, South Dakota, Virginia, Wyoming, and Idaho. The rankings are based upon economic data examined over the past 10 years to forecast future performance. Although states themselves present deficit figures, those amounts do not offer a full picture of the state's liabilities and can rely on budget gimmicks and accounting games to hide the extent of the deficit. SBS takes a straightforward approach to calculating total state debt, defining it as the sum of outstanding official debt, pension and other post-employment benefits (OPEB) liabilities, Unemployment Trust Fund loans, and current budget gap. While liabilities are not actually debt, they are a stream of future spending obligations that states have committed themselves to spending. Pensions and OPEB play a crucial role in straining state budgets. Minimum unfunded liabilities total more than $3.4 trillion right now. This year, SBS incorporated state pension liability figures computed by Andrew Biggs from the American Enterprise Institute (AEI) in addition to data from the Pew Institute, which were included in last year's state deficit study. The SBS "Just How Big are Public Pension Liabilities?" report explains how pension liabilities are calculated by states according to accounting rules different from the private sector. States are, for example, allowed to assume high rates of return without taking into regard the associated high risk. The AEI figures estimate how large public pension liabilities would be if states used private sector market-valuation methods. Pew warns that its estimates are low, so the AEI numbers are preferable in estimating the true value of state debts. According to AEI's numbers, total state debt for this year is more than $4 trillion. 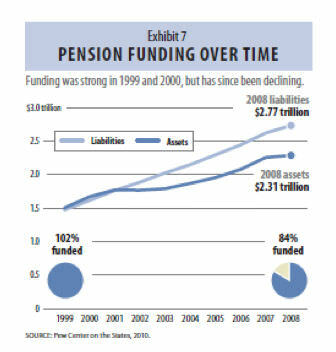 The total is more than $2 trillion utilizing Pew's pension liabilities, still up from $1.8 billion last year. Income tax rates were obtained from the Federation of Tax Administrators, and state rankings for past economic performance and future economic outlook are from the American Legislative Exchange Council's 2011 report "Rich States, Poor States." Outstanding debt and outstanding debt per capita were obtained from each state's most recent Comprehensive Annual Financial Report (CAFR), which can lag current data by one to three years. Pension numbers for this year were obtained from AEI's "The Market Value of Public-Sector Pension Deficits." A separate calculation was done using Pew's "The Widening Gap: The Great Recession's Impact on State Pension and Retiree Health Care Costs" report on pension funds as of 2009. OPEB liabilities were also found in this year's Pew report as well. Pension numbers from last year were from Pew's "The Trillion Dollar Gap: Underfunded State Retirement Systems and the Road to Reforms" report on pension funds as of 2008. Unemployment Trust Fund Loans were from the National Council of State Legislators, and current budget shortfalls are from the Center on Budget and Policy Priorities. Editor's Note: The spreadsheet linked to below has been corrected to reveal the proper state rankings for Outstanding Debt, found in Column I. There was an error in the sorting of the column, not in the amounts of debt. If you thought earning a fat pension in a public-sector job was a sure thing, think again. According to an analysis by the Pew Center on the States, state and local pension plans are operating under a deficit of at least $1 trillion. A separate report on 125 state plans by Wilshire Consulting found that the ratio of assets to liabilities -- the funding ratio -- of state pension systems slipped to 65 percent in 2009 from 85 percent in 2008. How did this happen? Simply put, the states didn't make big enough payments to their pension plans, they failed to squirrel away enough money to pay retiree health benefits and, perhaps most egregious, they increased their benefits without figuring out how to pay for them. Pew's $1 trillion figure -- tallied through the end of the 2008 fiscal year -- is conservative given that it doesn't capture the stock-market losses incurred in the second half of that year. To help close the gap, some states are scaling back their retirement plans. According to Pew, 10 states have curbed benefits to new workers or raised the retirement age. Nevada, for instance, changed the formula used to calculate pension benefits for those hired after Jan. 1 to provide a lower payout. It also raised the retirement age for public workers from 60 to 62, starting this year. Another 10 states -- including Iowa, Nebraska and New Mexico -- boosted employee contributions. Workers are also contributing more to the health-care plans they'll get once they exit the workforce. New state workers in Kentucky, for instance, must now put 1 percent more of their paychecks toward their retiree health plans. "If pension systems continue on the course they've been on, the bite out of state budgets will get bigger," says Katherine Barrett, consultant to Pew. Unlike the federal government, which controls the printing presses and can run huge deficits, states must balance their budgets. For states with severe deficits, that could mean an increase in taxes, a reduction in public services or both. Myth 1: Unfunded state pensions do not represent an immediate threat and are therefore not in crisis. Fact 1: In the best case scenario, some state pension funds will run out as soon as 2017. And the longer the states wait to fully fund their pensions, the more drastic the financial consequences will be. The fact that state pensions only represent a small share of state budgets doesn’t mean that they aren’t in crisis. Take the case of New Jersey. According to Joshua Rauh, professor of finance at Northwestern University, under the best case scenario, New Jersey’s pension funds (there are 5 of them) are scheduled to run out as soon as 2017. Once those state pension plans run out of money, pension payments will have to come out of the state’s general fund revenues—that is, out of the pockets of state taxpayers. Furthermore, there is reason to believe these estimates are too conservative. When private-sector accounting methods are used to show the true market value of state pension liabilities, the situation becomes even more critical than it initially appears. 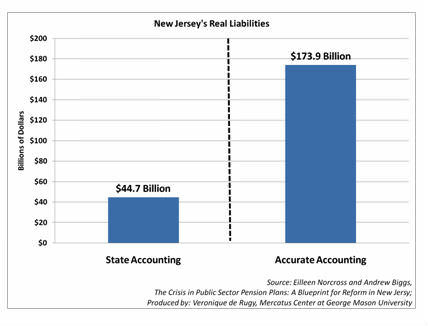 According to Andrew Biggs of the American Enterprise Institute and my Mercatus Center colleague Eileen Norcross, the state of New Jersey reports that its pension systems are underfunded by $44.7 billion. Yet when those pension plan liabilities are calculated in a manner consistent with private-sector accounting requirements—methods that economists almost universally agree to be more appropriate—New Jersey's unfunded benefit obligation rises to $173.9 billion. In other words, New Jersey has made a $173 billion promise without any idea of how it will pay for it. I would say that’s a crisis. This amount is equivalent to 44 percent of the state's current GDP and 328 percent of its current explicit government debt. This calculation applies a discount rate of 3.5 percent (the yield on Treasury bonds with a maturity of 15 years) to reflect the nearly risk‐free nature of accrued benefits for workers. It is estimated if state pension assets average a return of 8 percent, New Jersey will run out of funds to meet its pension obligations in 2019. If asset returns are lower than 8 percent, they will run out of funds sooner. This has real implications. State actuaries estimate that under certain assumptions, New Jersey’s pension plans will run out of enough assets to make benefit payments beginning in 2013. The irony is that New Jersey, like other states, has put itself in a financial binder even before the pension crisis really hits. That says a lot about the state’s future ability to address the problem. Myth 2: State debt accurately reflects state liabilities. And state default is not a concern because the federal government will bail the states out before they reach that point. Fact 2: Many government pension liabilities are kept off the books, so most states and cities underestimate their actual debt. Consider Connecticut. Bonds are only a small part of its total debt. 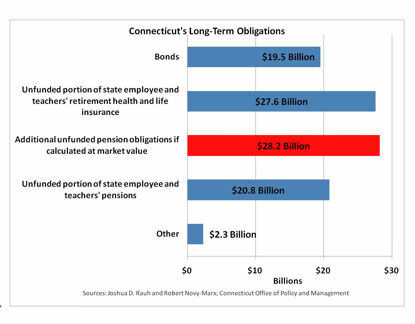 Like many other states, Connecticut also owes to its pensions and retiree health care funds, which are not clearly disclosed, and which will cost even more in the long run. Northwestern's Joshua Rauh and Robert Novy-Marx, an assistant professor of finance at the University of Rochester, have added Connecticut’s unfunded liability to the state’s debt. As you can see in the chart above, the state’s reported debt is roughly $23 billion. The official estimated value of its unfunded pension liabilities is $48.4 billion. That’s $71.4 billion. On top of that amount we should add another $28.2 billion in underestimated liabilities due to poor accounting standards. Now you have a total state debt of almost $100 billion. Would the federal government really have the ability to bail out 50 states whose individual debt often exceeds $100 billion? That would cost roughly $5 trillion. And while all of that money wouldn’t be paid out at once, it is still unrealistic for the states to count on a federal bailout. Myth 3: State and local workers are not overpaid. And even if they are, changing their compensation won’t make a difference. Fact 3: While this is a complex issue, the total compensation package for state workers does tend to exceed that of their private-sector counterparts. Take the case of Ohio. The Buckeye Institute for Policy Solutions has an interesting report out called “The Grand Bargain is Dead.” As we see in this example from Ohio, compensation costs for state and local employees begins at a higher level than that of their private-sector counterparts and continues to diverge throughout the employees’ careers. According to the Buckeye Institute, for 26 careers in state and local government paying around the median wage rate, government employees were consistently and significantly paid above the corresponding private-sector wage rate. Ohio has an on-the-book $8 billion budget gap. The data shows that in the Buckeye state, where almost one new public-sector job was added to the economy for each private-sector job from 1990 to 2010, realigning state worker compensation packages to match those of their private-sector peers would save taxpayers over $2.1 billion in the next two years (or 28 percent of this year’s $8 billion deficit). It is true that comparing compensation is a tricky business. While taking a closer look at the differences between public and private-sector employees explains some of the compensation differential, it is not great enough to explain the difference in wages between comparable public and private employees. 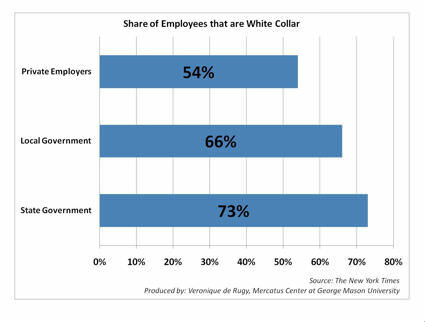 This chart from The New York Times shows that there are 12 percent more white-collar workers in local government than there are in private employment and 19 percent more white-collar workers at the state level. Some argue that this is the reason for the difference in compensation. It’s the diplomas stupid! Maybe, but all the diplomas in the world can’t explain the 221 percent difference in lifetime employment costs witnessed by workers in Ohio. Myth 4: The financial crisis, which caused a depreciation of pension assets, is the real culprit behind pension underfunding. Fact 4: While the recession dealt a severe blow to state pensions, the problem of pension underfunding dates back to the early 2000s. Many states had already failed to cover the cost of promised benefits even before they felt the full weight of the Great Recession. The problem started long before the recession. A 2010 Pew study called “The Trillion Dollar Gap,” found that in 2000, slightly more than half of the states had fully funded pension systems. By 2006, that number had shrunk to six states. By 2008, only four states—Florida, New York, Washington and Wisconsin—could make that claim. The chart above, taken from the Pew study, illustrates this point. Here’s the bottom line: We can argue endlessly over when the pension plans will run out of cash, or what the true value of the unfunded liabilities is. We can even debate what the true meaning of being broke. But there is one issue where there is no room for debate. Once the pension plans run out of money, the payments will have to come out of general funds, meaning out of the pockets of taxpayers. If the states want to avoid this, they must push through reforms as soon as possible. A good first step would be to switch to accounting methods that show the true market value of their liabilities. Once those methods are in place, lawmakers should consider moving away from defined benefit pensions. Take $3 trillion in unfunded legacy liabilities from state-sponsored pension plans, add $574 billion more from municipal and county pensions, and you have a fiscal tsunami that will make the Great Recession look like a cake walk. In “The Crisis in Local Government Pensions in the United States,” a new report issued by the Kellogg School, economists Joshua Rauh of the Kellogg School and Robert Novy-Marx of the University of Rochester calculate the aggregate unfunded liabilities and forecast the number of years assets will last for 77 defined pension plans sponsored by 50 major U.S. cities and counties. The sample represented all non-state municipal entities with more than $1 billion in pension assets, covering 2.04 million local public employees and retirees. “This new paper calculates the present value of local government employee pension liabilities for about two-thirds of total local government employees, and estimates the unfunded obligation for the remaining one-third of workers covered by municipal plans not in our sample,” said Rauh, associate professor of finance at the Kellogg School. dedicated tax revenues to cover pension promises. Rauh and Novy-Marx estimate that each household already owes an average of $14,165 to current and former municipal public employees in the 50 cities and counties they studied, including only the unfunded portion of benefits that have already been promised based on work performed. In New York City, San Francisco, and Boston, the total is more than $30,000 per household. In Chicago, the total is more than $40,000 per household. According to Rauh, it is clear that state and local governments in the U.S. are not far from the point where these pension promises will impact their ability to operate. Once the funds themselves are liquidated, the extent to which promised pension payments are competing with other local resources will skyrocket, eroding a large portion of many municipal budgets. “The fact that there is such a large burden of public employee pensions concentrated in urban metropolitan areas threatens the long-run economic viability of these cities, as residents can potentially move elsewhere to escape the situation,” he explained.